Here are a few pictures of Teena's large collection. 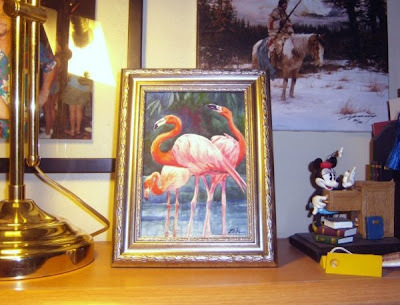 She says she has small Zeh watercolors which she purchased on eBay "all over the house" along with collections of other artwork. I know that she has also given many as gifts to friends! You may notice that two of the watercolors have no mat and most likely no glass. That is because they were painted on watercolor board and then varnished, eliminating the need for glass. You can also see how she has framed one of the miniature Art Cards - the sunflower - that are so popular on eBay - "floating" the painting on the backing. They look great, Teena! Thank you for sending the photos.